Castleford dominate this season’s Super League Dream Team, with six players selected. They are headed by Man of Steel nominees Luke Gale and Zak Hardaker, while England internationals Michael Shenton and Mike McMeeken also make it, alongside Super League’s top try scorer Greg Eden. Hull are the only other team with more than one selection, the third Man of Steel nominee Albert Kelly and powerful winger Mahe Fonua appearing. Wigan and England captain Sean O’Loughlin is selected at loose forward. 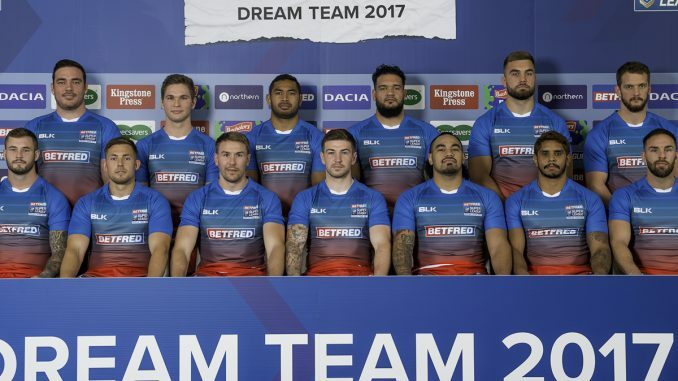 The Betfred Super League Dream Team is selected by a panel of the sport’s broadcasters and journalists in a secret ballot and represents the form team of the Betfred Super League season.